Hi everybody! 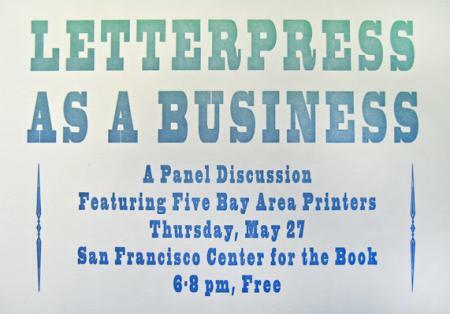 We recorded the “Letterpress as a Business” panel discussion at the San Francisco Center for the Book. Can one download this or subscribe to it via iTunes? @jonsel will post the event recording to iTunes in the next few days… will post the info once it’s done. Awesome. I hope they consider doing this kind of event on the east coast. Maybe NY’s Center for Book Arts could arrange something? That would be a great idea! The NY Center for the Book Arts is fairly similar to SFCB (several Vandercook presses, lots of metal type and rotating exhibitions, etc.). Thanks for the link! I have really enjoyed listening to these!